In our house, five is the magic number for dinner parties. Part of this is out of necessity -- we can only squeeze five people around our dining table. It also makes menu planning easy. Most recipes feed six to eight people, so you're always covered food-wise. But I also think five is a good number for conversations. It's intimate but still lively enough that it feels like a party. You never go to bed feeling like you didn't get a chance to talk to everyone and missed out on good gossip. But like many people who love to entertain at home, I've held onto a fantasy of hosting a really big party. Not five people, more like 25. I would swan around, refilling drinks and setting out tray after tray of delightful finger foods, dropping into conversations here and there. Now, this is unrealistic for many reasons, mostly because our circle of friends has been whittled down over the years thanks to people moving out of New York (losers!). Also, I don't own 25 forks. And don't really like making an entire menu of finger foods. So when I decided to throw a housewarming party for our new apartment, I struck a compromise with myself and invited eight people for a party of 10, counting Dan and myself. Ten seemed do-able. I would make a ton of food and it would be an actual party. 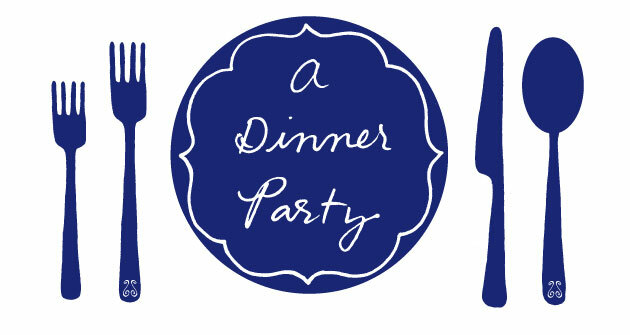 Not a dinner party, a party-party. In the end, it ended up being five adults and one toddler. And did I make less food? Absolutely not. Don't get me wrong -- it was a really nice night. I love spending time with every person who came and given that Mabel and the toddler spent the whole night winding each other up, knocking each other down and coming back for more, five was probably a much better number anyway. But back to the food. My original plan was to make a menu designed for grazing: olives, prosciutto-wrapped pears, blue-cheese stuffed Peppadew peppers, spiced nuts, lamb meatballs with yogurt sauce. And then the guest list dropped so I reverted back to my usual seated-dinner menu planning mode, which means family-style dishes. I thought about making another big kale salad and maybe some other sort of hearty grain, like farro with mushrooms! And hmm, maybe some crusty bread on the side. The bread would need some sort of topping...maybe ricotta with herbs? And mini chocolate croissants for dessert! A sane person would forget about the finger foods. Or buy a dessert at the supermarket. Or just make finger foods and forget about the salads. But no, I cooked all of it. As if that would somehow make the housewarming a party-party. Who cares if I made too much food? Like a person drinking her way towards a hangover, I would worry about the leftovers tomorrow. Shockingly, there weren't many leftovers. There was some farro, which Dan was happy to eat all week long, and the kale salad, which keeps wonderfully for a few days. Other than a few pieces of cheese and some bread and olives, everything disappeared. I couldn't believe it. How did we eat all that food? Not having to deal with leftovers is great, but I got to talk to everyone, cuddle with a toddler and swan around a little bit. Maybe five really is the magic number. From Nigella Lawson via the Food Network, these tender, richly spiced meatballs were the hit of the night. The recipe, which calls for one pound of lamb, is supposed to yield 78 meatballs, which I guess could be possible if you made them itty bitty, using a teaspoon. I don't think many people would do it that way, including myself, so I made about 25 normal-sized meatballs. Put the lamb into a bowl and add the scallions. Sprinkle over the spices, salt and semolina, and add the beaten egg. Work everything together thoroughly with your hands, and then cover with plastic wrap and leave in the refrigerator for half an hour. To make the meatballs, line a baking sheet or large platter with plastic wrap and scoop out a scant teaspoon of the mixture (or use a small spoon). Roll in your hands to form the meatball and place on the lined baking sheet. Have a bowl of cold water beside you to dampen your hands with; this helps them not get too sticky for rolling the meatballs. When you are ready to cook the meatballs, heat about 1/2-inch of oil in a large frying pan. Line another baking sheet or platter with paper towels, and when the oil is hot, fry the meatballs in batches without overcrowding the pan. If you are making tiny meatballs, cook them for about one minutes a side, or until golden brown all over. Larger meatballs will require a few minutes more. Do we know 25 people who like us enough to show up? Do we dare find out? Daniel: Maybe we'd better not.